Working every muscle to its maximum potential in seconds! To help you on your quest to total body transformation and mastery here are some great Isometric Exercises. 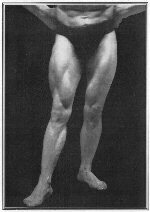 I'm going to focus on pure Isometrics or Muscle Control in this article. If you need more information on any topics like weight lifting and strength training just check out the articles page. Select a muscle. 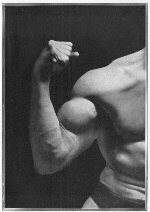 Let’s say the Biceps at the front of the arm. Below are two photos of Maxick peforming a stand alone bicep contraction. Now I’d like you to do this with me, okay. Bend you arm at the elbow at a forty five degree angle. From the shoulder to the elbow your arm should be straight along the side of your body. 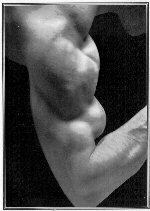 Now with you arm flexed tense your bicep as hard as you can – WITHOUT MOVING YOU ARM! You’ll feel the blood rushing to the muscle and feel it getting warm and tired. You’ve just completed an isometric exercise! Let’s work a larger muscle! How about the Quadriceps, the large muscles on the front of your legs. Below is another photo of the Great Maxick demonstrating a quadriceps extention, just like the one you will perform shortly. Slowly tense the legs until the muscles are standing out in high relief. Slowly relax the muscles and repeat on the opposite leg. Feel the blood rush and the deep sense of relaxation that accompanies each contraction and relaxation? It’s like stretching the whole body first thing in the morning! That is the way exercise is meant to feel – a pleasant, enjoyable experience that leaves you feeling invigorated and refreshed! This feeling is caused by the release of special chemicals called endorphins. These natural feel good vibes are you bodies way of encouraging you to do this! If you really want to realese your potential and enjoy the natural buzz exercise brings you should consider training with me using online personal training. You can learn more about what online personal training is, and if it's right for you, by clicking here. Leap frog from Isometric Exercise to the Articles Page Right this second!